Want better results from your email marketing? Who doesn’t? Especially now, when it’s almost time to roll out those holiday email campaigns. The pressure to get results is high. If you’re feeling the pressure, I’ve got good news. There’s every reason you can spike your email marketing results – and fast. If you’re still sending the same email to everyone on your list, now’s the perfect time to run a few quick tests, and then roll out some segmented emails to your list. Those of you in B2B have a different opportunity. It’s the end of the year, so anyone left with 2015 budget needs to spend it now or lose it. And there’s still plenty of time to close a few sales before the year ends. Make the right case with your prospects, and your 2015 sales could still see a handsome boost. 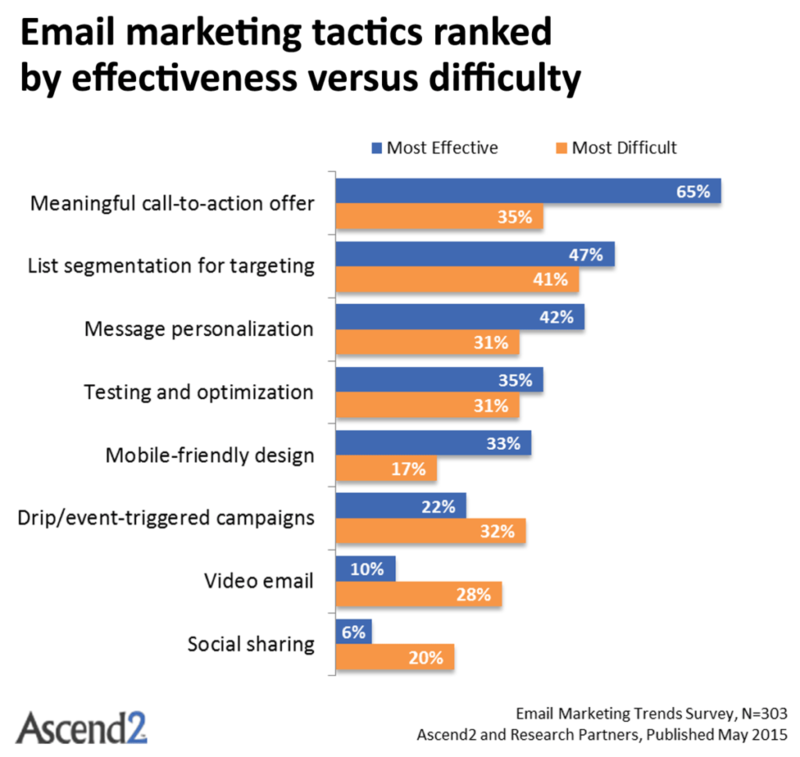 According to the email marketers Ascend2 surveyed for this study, segmentation comes in as the second most effective email marketing tactic. It’s right after having a strong call to action. Trouble is, it also comes in first in terms of difficulty. That’s troubling. Segmentation doesn’t have to be as hard as it looks from this chart. You can make it crazy complicated, sure – but we’re interested in doing the simplest segmentation for the biggest results. It doesn’t have to be hard. If you can get even one or two segmentation tests done before the year, you’ll also be laying the groundwork for your 2016 email marketing. Or maybe you’ll catch up with a 2015 resolution you haven’t made good on yet. A lot of marketers said they wanted to move forward with segmentation this year. Before we get too deep into nuts and bolts, let’s look at the different types of segmentation, from the simplest to the most complex. That’ll give you a lot of ideas about what’s possible, and about what might be right for your list. As the graphic below shows, there’s a bunch of different levels of email list segmentation. The simplest, “batch and blast”, usually refers to no segmentation: You just send the same email to everybody. That’s what we want to move away from. At the next level of personalization, you’re using basic customer profile information. This is information people gave you when they signed up for your list. Stuff like their zip code, gender, and age. Here’s an example of an email message that uses profile-level segmentation. This is an email I got recently from REI. 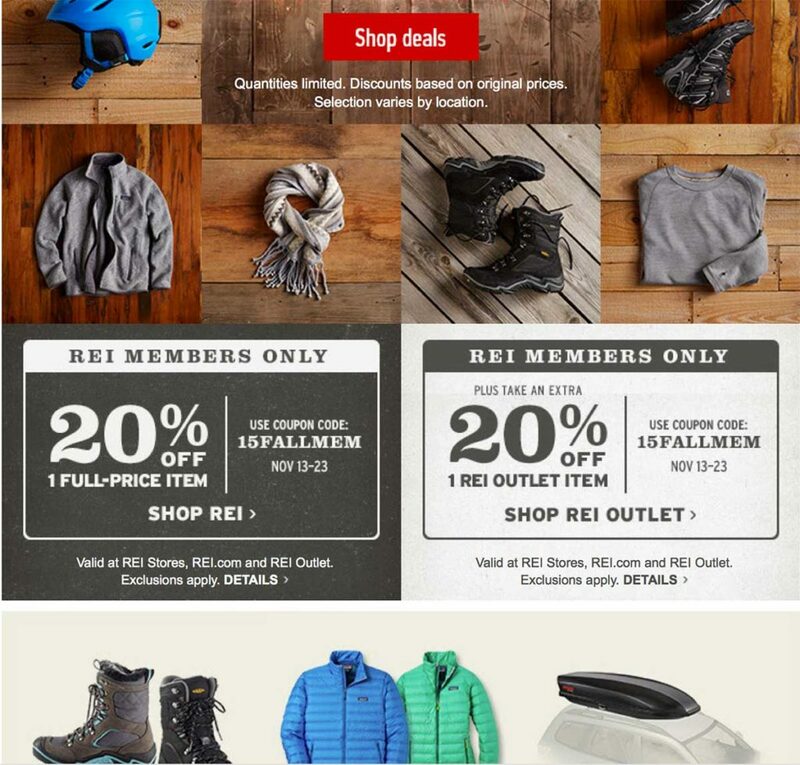 I’m an REI member, and so they’ve sent me an email with two offers for REI members only. Nothing too complex here, right? But even this basic segmentation can make a big difference – like a 20% boost in click-through rates. How might you split up your list with the profile information you’ve got? Would it be based on gender, or some other thing you ask about on your sign-up forms? The next level of persona-based segmentation is a bit more sophisticated. Simply because we’ve got a persona here, it suggests there is a content marketing strategy. Personas, as many of you know, are basically customer types. They’re used so a marketer can identify how certain types of buyers behave. We’ve got a recent guest post about using personas in email marketing here. Personas are a smart way to tailor the content your audience receives based on who they are and how they behave. It’s a technique that often works in tandem with marketing automation. The online retailer Onward Reserve shared a great case study of how persona marketing worked for them. The next level, behavioral segmentation, can be simple or complex. Just segmenting based on which subscribers clicked a link in an email is behavioral segmentation. Say you sent out an email to your entire list about a new ebook you’d just written. You could segment out the people who never clicked the download link in that email. I’ll show you how to do that in just a moment. Behavioral segmentation can also include cart abandonment emails and webinar follow-ups (for more ideas check out this article). 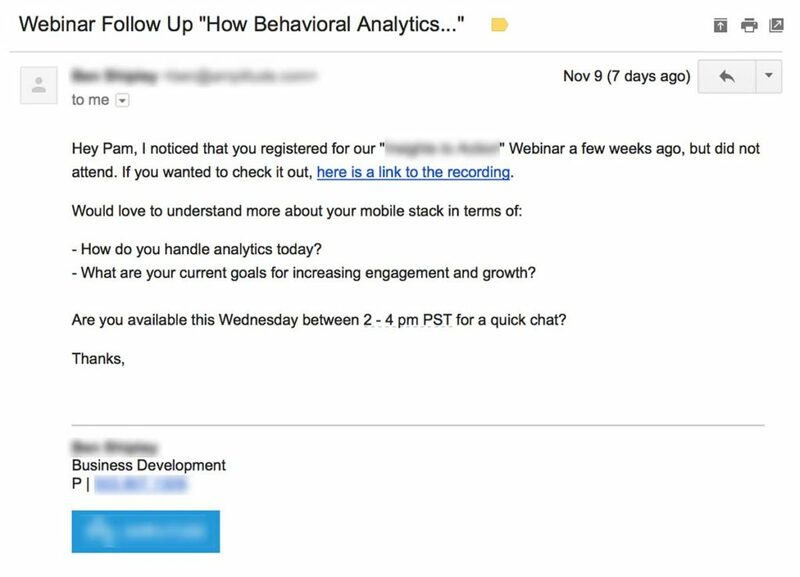 Your behavioral emails could also be “triggered” emails (there’s that marketing automation thing coming up again…). Or you could send a specific email to one group of subscribers who attended a webinar, and a different email to all your other subscribers. It can get more complex than that, but you get the gist. The email below is follow-up from a salesperson about a piece of CRM software I signed up for a trial of. This is an example of an email sent based on past behavior. They probably sent this email out to everyone who attended the webinar. Note that they obviously wouldn’t send this out to their whole list – that’s why it’s a segmented email. Here’s an interesting twist on behavioral segmentation: segmenting subscribers out based on where they signed up. The retailer Hotel Chocolat had built up a fairly large email list, both from signups from their website and from signups in their stores. So they decided to send different emails to those two groups. The result? Open rates, click-through rates and deliverability all improved. If you’re signing people up from different sources (like a Facebook page) this might be a worthwhile test. Predictive modeling blends persona marketing, databases, and an algorithm. It attempts to guess what subscribers want to know next. Because of this, it can be helpful for automating content through complex buyer journeys. If you’re a small shop or don’t have a large marketing budget, predictive modeling may be outside your ken, but you should know it exists. Remember how I mentioned that email you could send about the product launch, where people got the email, but then never clicked the link in the email? Let’s set up a segment like that. Choose the campaign (i.e., the list) you want to pull the segment from. 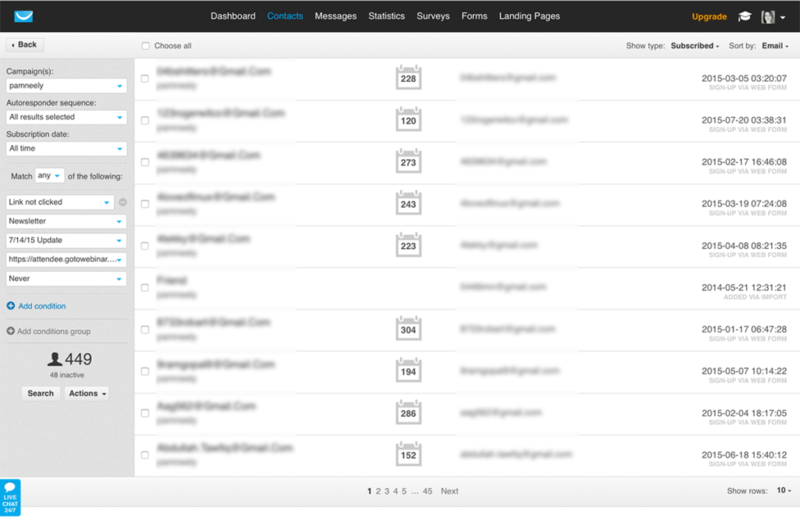 Then select the autoresponder or signup date parameters – but only if that makes sense for who you want to segment. You can also leave those options alone. I want everyone who didn’t click the link in the email, so I’ll choose that selection in the pull-down menu. 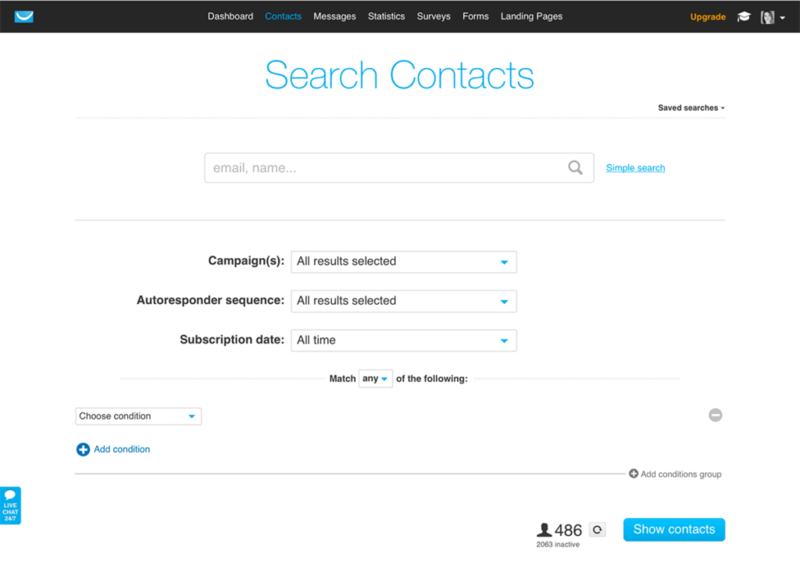 Next, the system will ask me which kind of email I want to segment from: a Newsletter, Autoresponder or an A/B test. I want Newsletter. Then it will ask which message. You can select “all messages and links”, but I want a link that’s in a specific email named “7/14/15 Update”. The system will then show me all the links in that email. I’ll select the one I’m interested in. Those are my settings. Now I click the blue “show contacts” button. It shows me everyone who got the email, but didn’t click that link. If I check the “choose all” box near the top of the list, and then choose the Action pull-down with the selection “move to campaign” I can then move all those subscribers into a new campaign… BUT I’ll have to create the campaign before I do that. You can’t create the campaign from within that view, so you’ll need an already-created campaign. You could also just export that segment of subscribers, and then re-upload it and mail to them. 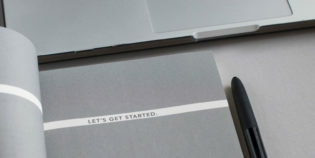 For more details on the ins and outs of managing your contact lists, check out the dedicated FAQ section. Here’s one last trick to speed up your work: You don’t have to make an entirely new email for every segment you mail to. Make the email for the largest segment first, save it, and then make a copy by clicking the “Actions” button to the right of the email’s message name. Select “Re-use” from the pull-down menu. Then just rename the email to create a new version. Alter that new copy based on what you want to say to the next segment. No need to re-invent the wheel every time! Are you segmenting your email messages? Do you do it for every email you send, or just for special messages? If you’d like to share any results of your segmenting work with this, we’d love to hear it. Tell us about it in the comments.